Haiti-born artist Hertz Nazaire explains why he rejected commercial success in order to bring visibility to those, like him, suffering from Sickle-cell disorder. 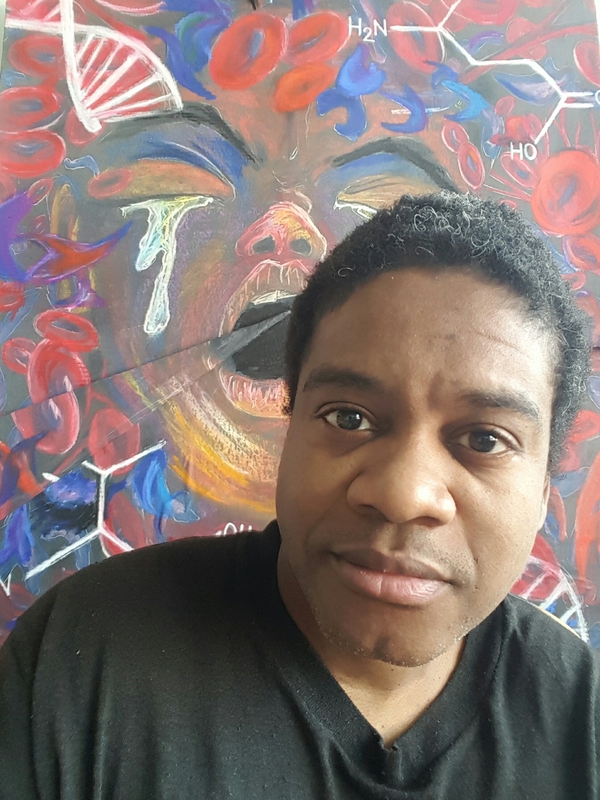 When painter Hertz Nazaire reflects on a childhood spent with Sickle-cell disease — a blood disorder which increases the likelihood of anemia, bacterial infections, and chronic fatigue and pain — he remembers not being allowed to suffer. 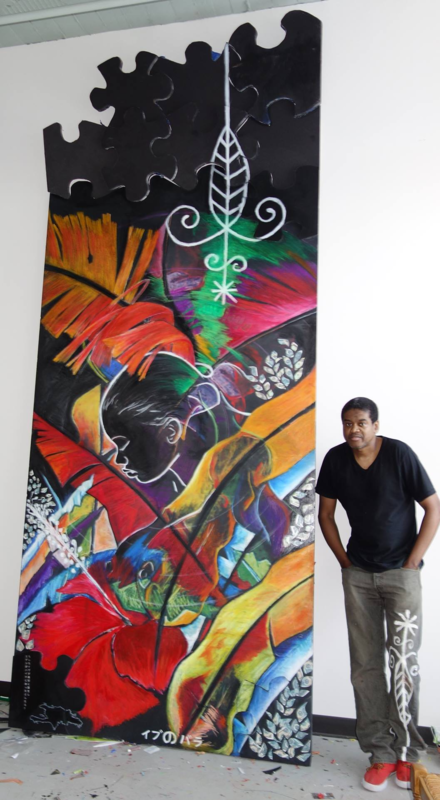 Hertz Nazaire, standing in front of his art. He poses a memory not immediately unusual: adults crowding around a kid with a chronic condition, convincing themselves that recovery is possible and even imminent. What’s forgotten is the child that carries the worry of these well-meaning adults, these anxiety-ridden caretakers search for a solution to something that’s embedded in your genome. Nazaire was a kid whose active pain haunted those closest to him. Suffering wasn’t an option; it pained the adults who planned to fix it. Now 42, Hertz joined us at Folks to talk about his art as an expression of pain, and why more artists and public figures don’t talk about their chronic conditions. How did you get into art? I understand you grew up in Haiti, and I’m interested to hear about your early influences. I was born in Port-Au-Prince, Haiti and grew up in a section called Carrefour. As a kid, I was often sick and I used to sit inside and watch these trucks that worked as taxis called Tap Taps. They had these very colorful designs and murals on them, so it was like having paintings on the streets and moving all over town. It was inspiring. Some had landscape paintings and others had depictions of Jesus or something religious. It was the most colorful thing I’d ever seen. Cars in the ’70s and ’80s were plain, but these were like tropical foliage moving under the sun, and it was uniquely Haitian. Tell me a bit more about your childhood and what brought you to the United States. My mother left Haiti to find work in the United States when I was still a baby. My childhood was difficult because I didn’t only stay with one family. My mom sent money back to the people that cared for me, but because I was sick each family would eventually feel overburdened and my mom would have to move me. Throughout my childhood, I never had an outlet where I could prove that I was capable of living a normal life. Eventually, I moved to Bridgeport, Connecticut when my mom got married. During the four years that I lived with my mom before she died, she cared for me. She would get me up at 3:00 AM if I was having a crisis and rush me to the Emergency Room. You have to understand, though, that it was embarrassing to have to wake up your mom because you’re crying at night and sick with a painful crisis. Often she would be at my door before I had to say anything. She had to go to work most mornings but would spend a few hours at the Emergency Room just to make sure I was cared for. 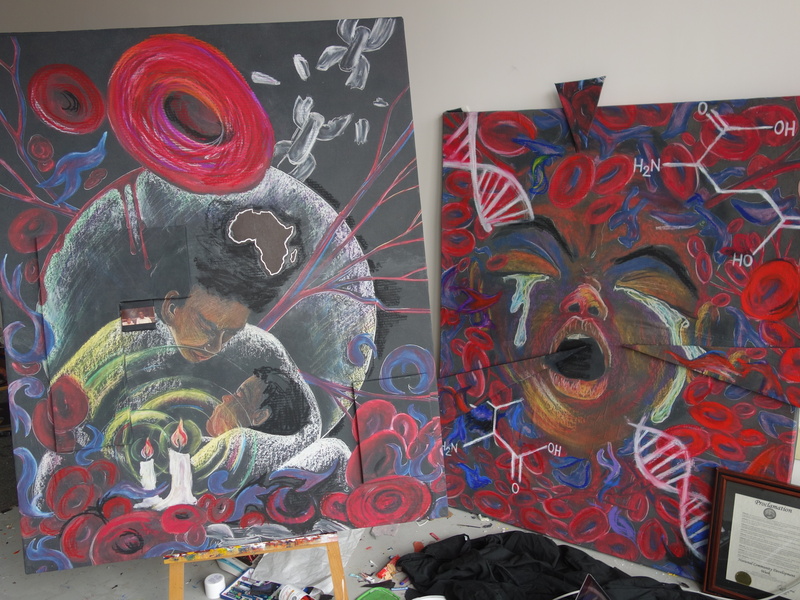 Some of Nazaire’s pain-inspired paintings. How did your mother respond to your illness in general? In Haiti, people are very religious. If you have an illness, they say that you must have faith and spend time in prayer to be healed. With the culture of voodoo, a sick child meant that someone had sent a curse to the family. When I moved to the United States, this legacy followed me. 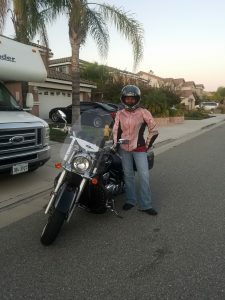 A friend of my mom’s said that I needed to go see this lady named Amazing Grace. She was a healer that would hold conventions where people in wheelchairs or with various illnesses would show up to be healed. She would speak and then lay hands on the people, pushing them to the floor and saying that they were healed in the name of Christ. In Haiti, people are very religious…With the culture of voodoo, a sick child meant that someone had sent a curse to the family. Yeah, as a child, it was an amazing experience. I remember that after the woman touched me I fell down. My mom was crying, and this lady told my mom that I was cured. For the next ten months, every time I got sick I would bear down and keep it a secret. It was heartbreaking because I was suffering but I couldn’t tell my mom. I wanted so badly for her to have this miracle. I wanted her to have a respite from my illness. Remind me again how old you were? After something like this, what does an eleven-year-old think about the world? You realize that you will suffer, but people won’t accept your suffering. They want an easy answer, a magical solution. As a kid, every family I lived with had different beliefs. One of them was Protestant, one was Baptist, another was Catholic. But when I was sick, they wanted to pray for me. People don’t understand that this is in my DNA. 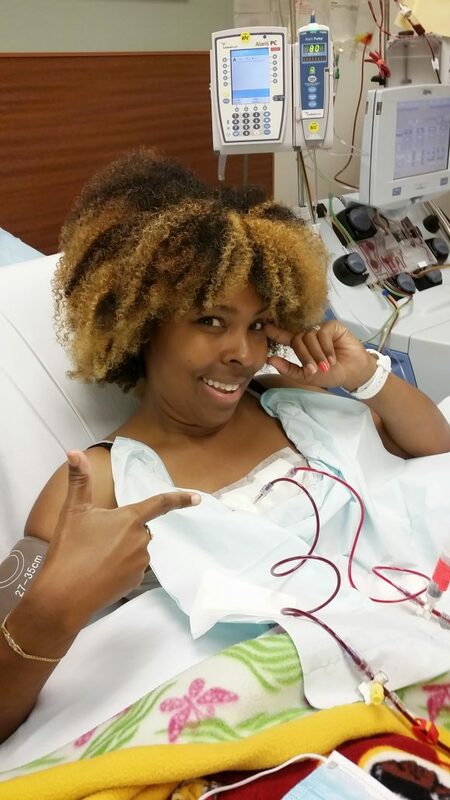 Sickle-cell is part of my reality. Do you think they meant to explicitly ignore your suffering? Despite his chronic fatigue, some of Nazaire’s works are extremely large. Again, they wanted to find an easy solution. It was hard for them to look at a child that is hurting and not be able to do anything about it. They felt helpless but wouldn’t acknowledge it. The thing about Sickle-cell is that it’s genetic. It takes two parents that have the trait, and so there’s a guilt factor that’s embedded here. I didn’t want my mother to feel bad, and that was a heavy burden for a child to carry. You seem to have spent much of your childhood ensuring that others did not suffer because of your condition. With Sickle-cell, you have to carry everyone’s burden. My mom felt a lot of guilt because of my illness and for leaving me in Haiti, so it was difficult for me to tell her what I went through. I would see the pain in her eyes and understand that this was not something I could tell her. 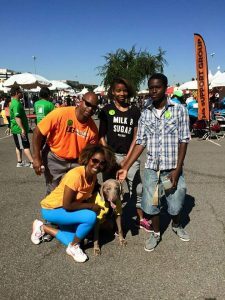 What are some of the routine challenges of living with Sickle-cell beyond the emotional trauma? After my mom died and I graduated from high school, I had to work three jobs to pay for art school. Eventually, though, I had to drop out. One of the aspects of Sickle-cell is that less than half of your blood cells work properly, and you can’t get the oxygen supply you need to your tissues. The consequence is that your blood cells die off faster than normal, so you are always anemic and weak. Just getting the energy to get up and paint is hard. Each day you have to work with half the fuel of a normal person, and if you push too hard you have a crisis and you end up in the hospital for two weeks. For me, it’s like a cycle of rebirth. I make it to a certain point but then have to start completely over again. You must learn how to be steadfast and bear it. For me, [Sickle-cell] is like a cycle of rebirth. I make it to a certain point but then have to start completely over again. How has this affected your art? Well, I went blind for two weeks when I was twenty-five and eventually lost my vision in my right eye. It has made drawing difficult. To be an artist and not be able to see is incredibly hard, and I didn’t paint for three years. Now I paint large paintings because working in details is a challenge for me. Also, I don’t live in New York, and I’m not trying to commoditize my art or turn it into a brand. The truth is that I can’t; I don’t have the energy. What inspires my work is a desire for people to have a sense of compassion and an awareness that people with Sickle-cell are suffering and you can’t just pray it away. You have to do something. You have to act, even if you believe in God. You still have to help these people get over their pain. Pain is a theme in much of your art. You actually describe yourself as a PAINter. Could you expound on this? When I paint about Sickle-cell there is an incredible burden because I really want this work to reach someone. What I’m working on right now is called the Tapestry of Pain. It’s a large mural that features the portraits of people that have passed away from, or continue to live with, Sickle-cell. It’s difficult to even finish this because these people have either died or are still suffering. I have a feeling of a deep respect and responsibility to honor these people. Do you have a sense that your posture towards art separates you from other artists? I have seen the life of the artist. A close friend of mine that grew up with me in Bridgeport is now a prominent artist in New York and sells his paintings for 50 thousand a pop. He tells me that I basically pigeon-holed myself because I did all this Sickle-cell work and no one sees me as a serious painter. But so be it. This is the path I have accepted. Granted, I wouldn’t mind selling my work for 50 thousand dollars, but I have embraced this path of making Sickle-cell pain visible. 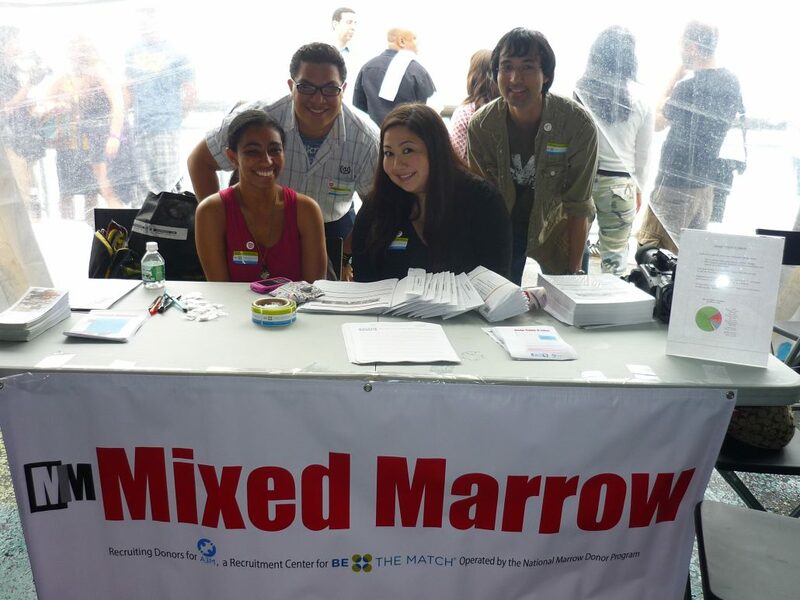 Is it ever tempting to want to leave Sickle-cell work behind? I go to many meetings where I give motivational talks to young kids that have Sickle-cell. On one occasion, there was a young boy that wasn’t able to make it and his social worker asked me if I would like to go to the children’s hospital and see him. I agreed and visited him for an hour. We talked about the Japanese animation that we both liked. He also drew about his experience with Sickle-cell and said he was inspired by my art. He was just like me. By the time I took the train home from the hospital that night, the kid had died. This is what makes Sickle-cell real. If there’s a child out there that is still suffering, it’s a worthwhile thing for me to do. I have seen a lot of artists on something like PBS talking about their art work. I’ve also been on PBS, but I was sitting there talking about pain. That’s my journey. 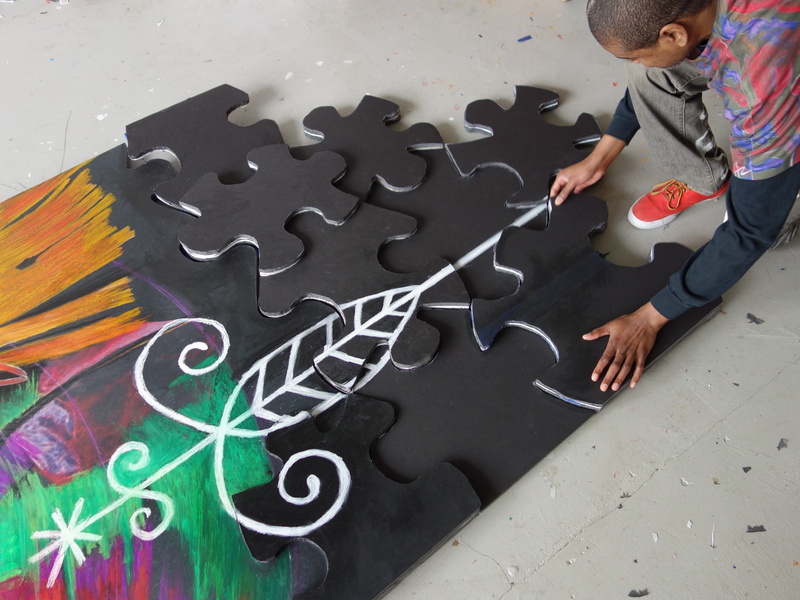 Nazaire at work on one of his paintings. 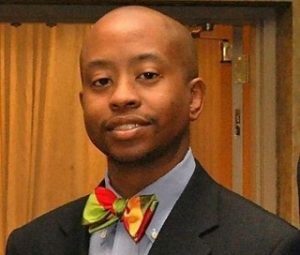 Why do you think more public figures don’t talk about their Sickle-cell? Why not fight? There are the politics of weakness. You don’t want to be perceived as weak. The other aspect is the shame and the guilt. Nobody wants to feel ashamed because they have this condition. If you were a kid that was constantly treated differently, even by your own mother, wouldn’t you want to hide, too? You want people to see what you’re capable of, not what’s holding you back. In a way, I can understand why other artists might hide. You want people to see you for what you create and the vision you have as a human being. Instead, they see a disease. You want people to see what you’re capable of, not what’s holding you back. I recently entered an art contest for rare diseases. The winner will get their art shown in Washington DC on Capitol Hill during Rare Disease week, which is March 1st 2017. To vote for my Sickle Cell art just go to www.sicklecellvotes.com. This is just part of finding more ways to give Sickle Cell Disease a voice. Honestly, I don’t know if my art can make a difference, but it’s part of the puzzle. There is nothing else I can give to this world. The only thing that I can do is create this tapestry and hope that when it is seen, it will touch people that have the power to make a difference. A cure is possible, but someone must demand it.